What does that mean? Don’t talk down to the person or treat him or her like an infant. This is sometimes called "elderspeak" and it's got to go. Have you ever observed how people talk to babies? They might use a high pitched tone and get close to the baby’s face. While this is appropriate for infants, it’s not fitting for communicating with adults. Regardless of how much the person with dementia can or cannot understand, treat him or her with honor and use a respectful tone of voice. Learn what the person’s preferred name is and use it. Be careful with using "honey," "sweetheart" or similar terms. You may mean it genuinely in affection, but it can also come across as demeaning or patronizing. While some people might get defensive if you break their bubble of personal space around them, many appreciate a gentle touch. Knowing how someone responds to physical touch is important. You might want to give a little pat on the shoulders or hold her hand as you talk with her. Personal touch is important and can be an effective way to communicate that you care. Capitalizing every word in that sentence feels a little like I’m yelling at you, right? It can feel the same to a person with dementia when we use a loud tone with them. Use a clear, normal tone of voice to start a conversation with someone. If the person doesn’t respond or you become aware that he or she has a hearing problem, you can increase your volume. Speaking in a slightly lower register can also help if someone has a hearing problem. As dementia progresses, it can become harder for someone to understand what you’re trying to tell them. For example, telling a loved one with Alzheimer’s disease that it’s "no use crying over spilled milk" might result in him looking to see where the milk has spilled, rather than end up comforting him or encouraging him not to focus on a past problem. In fact, the Proverb interpretation test, which asks the test taker to interpret abstract ideas such as the spilled milk reference above, is one was to screen for symptoms of dementia. If you have a question, ask the individual first to give him a chance to respond before turning to his family for an answer. Also, don’t talk about the person as if he’s not there. He might understand more than you give him credit for, so convey your respect by addressing him directly. Rather than standing up straight and looking down to someone who may be seated, bend down to be at the same level as they are. This might make you less comfortable physically, but it will facilitate a more comfortable and respectful conversation. Limit your questions to just a few. Your goal is to encourage and provide encouragement during your visit, not to fire endless questions at them that may be difficult to answer. In dementia, a genuine smile can reduce the chance of challenging behaviors since the person may feel reassured by your non-verbal communication. Your warm smile and eye contact convey that you are glad to be with her and are two of the most important factors in communicating with anyone. Infusing your communication with respect and genuine warmth will increase the odds of success, whether the person to whom you're speaking with has dementia or not. 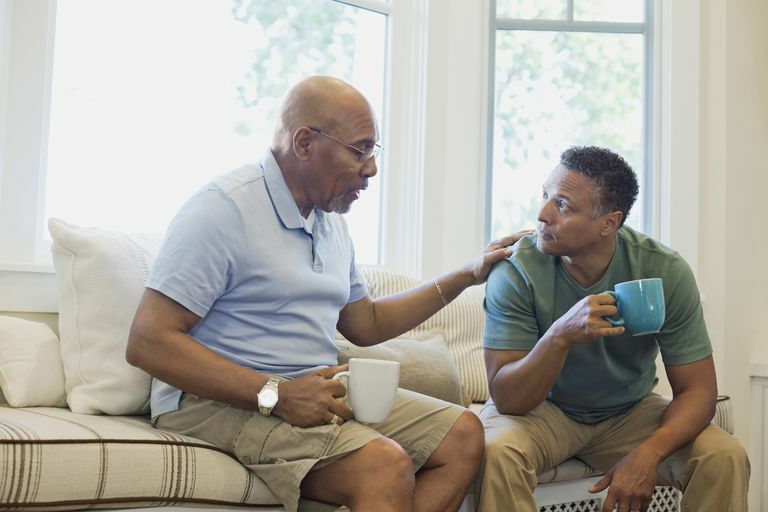 For more communication tips, avoid these 10 pet peeves when spending time with someone who is living with Alzheimer's. Can You Tell If Someone Has Dementia by Watching Them? Why Does Dementia Cause People to Lack Inhibitions? Does Your Loved One With Dementia Wear the Same Clothing Every Day?